Last week, I stopped at NECI on Main for a meeting with New England Culinary Institute executive chef Jean-Louis Gerin before reporting this week's feature in Barre. 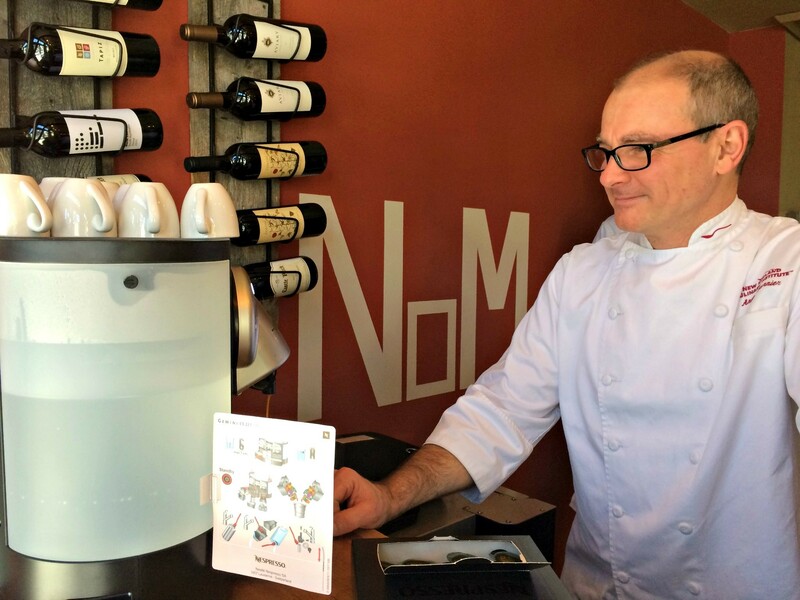 He and chef-instructor Andre Burnier were excitedly playing with the restaurant's newest addition: Vermont's first Nespresso machine. "It took just over a year of begging," Gerin revealed. 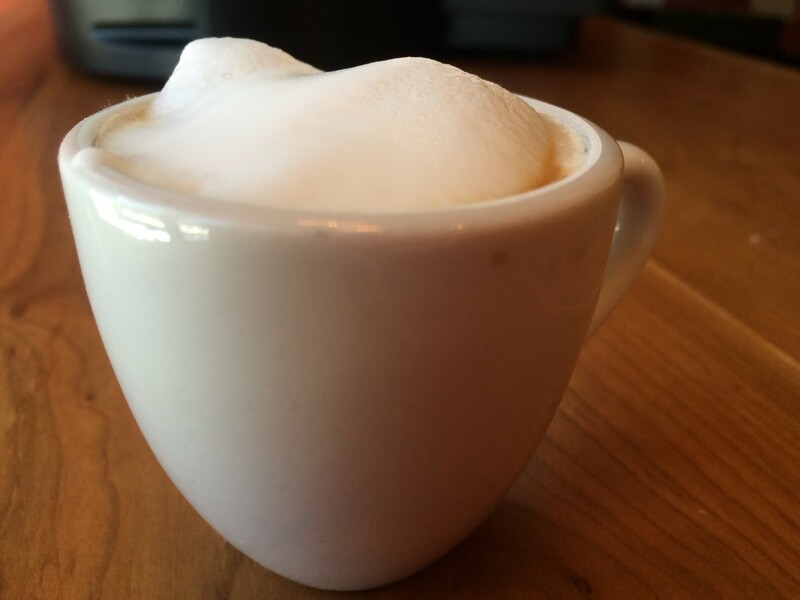 "It is the best espresso around here," Burnier said of the machine. "The best anywhere," Gerin corrected. As a non-coffee drinker, it tasted like espresso to me. But the texture was exceptionally smooth, with a cloud of foam on top. That Sunday, on my way to another engagement further south, the caffeinated reveille got me thinking about how much I miss NECI brunches. Back when the school had a campus in Essex, I was a regular. My other half got a job serving on Sundays just to feed his habit for student-cooked omelettes. But we hadn't partaken since NECI closed its Essex location in 2009. We were more than overdue. What we found was less focus on the old showpieces of carved watermelons with the fruit plate and ornate cured fish, and a more exacting eye toward worthwhile, real-world culinary skills. The school's meat fabrication kitchen, located inside Vermont College of Fine Arts, was responsible for the most impressive products. 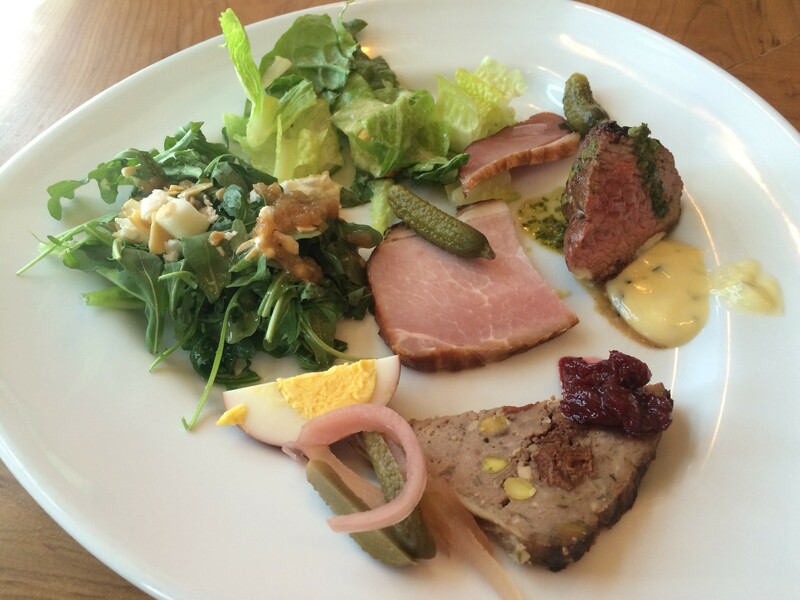 Charcuterie included toothsome, smoky ham and velvety duck. The ham was so irresistible, I ate it cold, and then warm among the breakfast meats served with pillowy mini pancakes. I indulged in the charcuterie alongside a Caesar salad and one with goat cheese and apples. A student-carved tri-tip proved to be a bit tough. But another meat served by a student was anything but. Who knew Queen Elizabeth was a charcuterie fan? Fulfilling a project in which she was tasked with creating a dish from a particular time period, that student chose the time of Queen Elizabeth I and started from there. 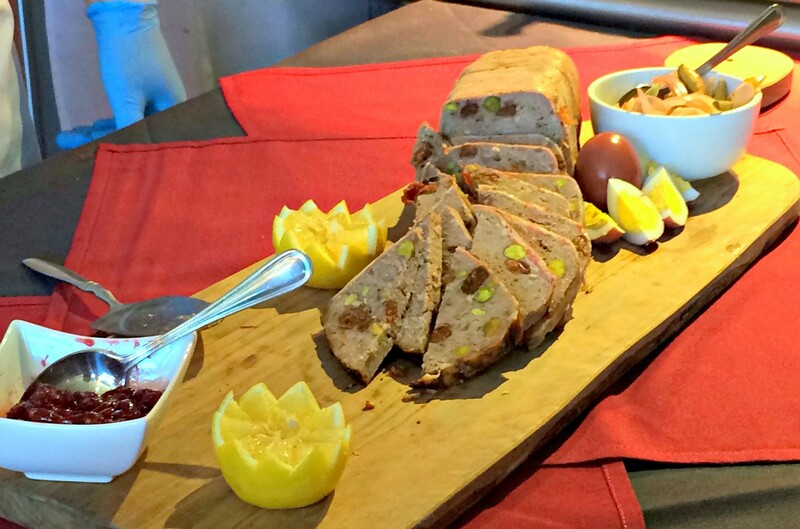 Looking at historical recipes, she created a venison terrine, smoothed with pork fat. The pistachios, rolled into the forcemeat with cherries, were rare in England at the time, but would have been a royal indulgence, the student told me. Lightly gamy, with a hint of sweet, nutty flavor, it was an edifying taste of history. It was even better eaten with tangy, historically accurate cherry preserves and slices of pickled egg. As if crisp salmon in beurre blanc and intense, bacon-speckled coq au vin weren't enough, there were still student-cooked omelettes. Unlike in the Essex days, these are now prepared in the kitchen. Diners are given a small menu of options from which to choose. But I had to subvert it. I asked the cooks to combine the pesto-and-goat-cheese one and the one using house chorizo. It was a good combo, with the fresh, green flavors of the pesto combining with zesty chèvre and cumin-laden homemade sausage. 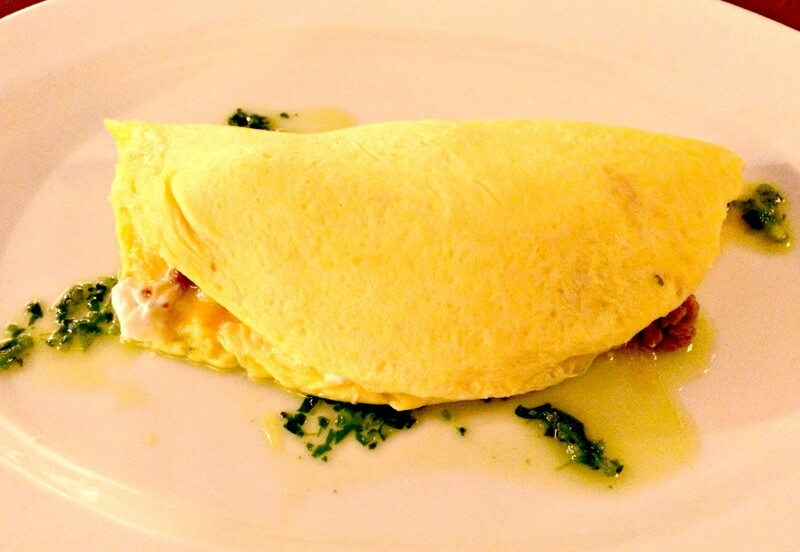 As much as I enjoyed that slightly runny omelette, though, I couldn't finish. I had to save room for dessert. The sweets table was covered with more than a dozen different small bites. That meant I would skip usual suspects such as cake balls and Rice Krispie treats in favor of more exotic fare. This sometimes backfired. A crumbly tahini cookie was just as unpleasant as the halva my dad ate when I was a kid. A mini homemade Pop Tart was all undercooked dough. But there were winners. A tiny chai truffle sang with spice. A dense, chewy rye cake carried the grain's unmistakably earthy flavor. 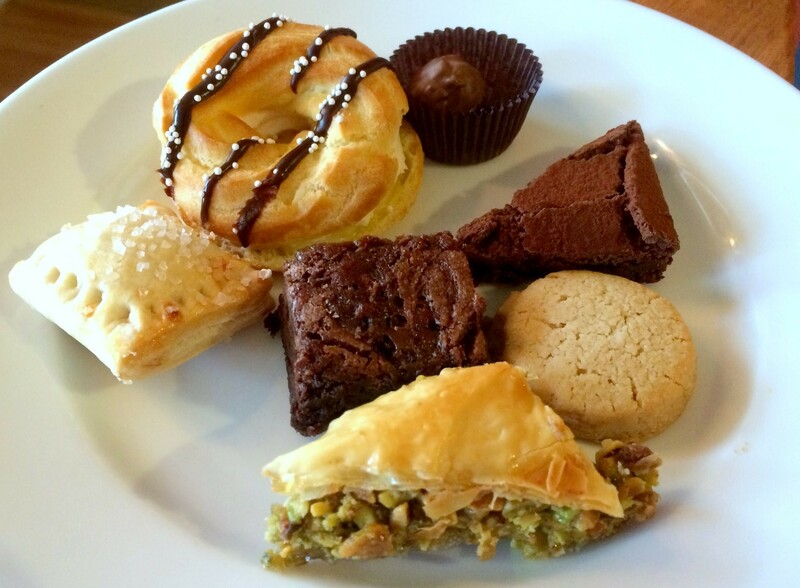 I continued my pistachio kick with a perfectly marvelous baklava. But the highlight was a crackling mini Paris-Brest choux filled with Earl Grey cream. The cream puff was textbook and the fragrant cream truly did taste of tea. I can't complain about the drizzles of chocolate on top, either. Now that the brunch floodgates have opened, I'm eager to return to see what other creative treats the students put forth. Between that and old-world classics (in some cases way old world), NECI's brunch has more reasons than ever to feed my addiction.